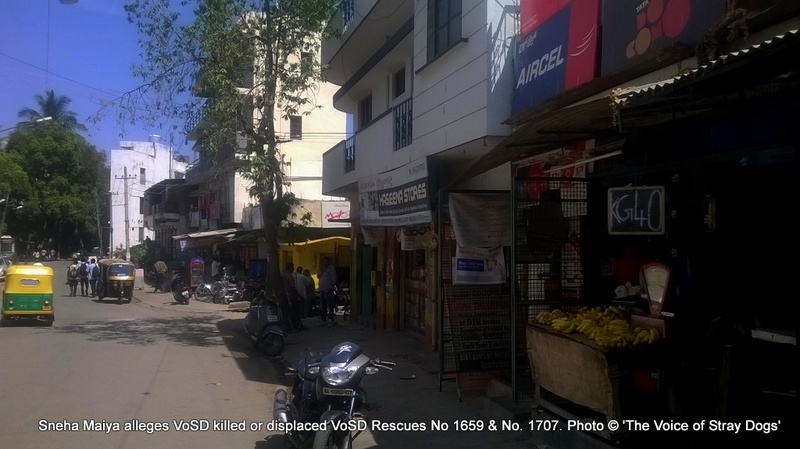 Sneha Maiya alleges VoSD killed or displaced VoSD Rescues No 1659 & No. 1707: Easily disproved on the strength of VoSD Rescue protocols and because we went back & found the dog! Of the 230+ articles published by this publication this is the 1st being written and published in 1st person. At it is in response to a motivated attack by a person, possibly persons, alleging that I and VoSD have either killed or displaced dogs we rescued – without a shred of evidence or the capacity to assimilate the information and evidence to the contrary. And actually engaged senior ‘professionals’ in ‘animal welfare’ to approach VoSD on the basis of this allegations – with them not once approaching us for an explanation either. – Rakesh Shukla, Founder of The Voice of Stray Dogs. 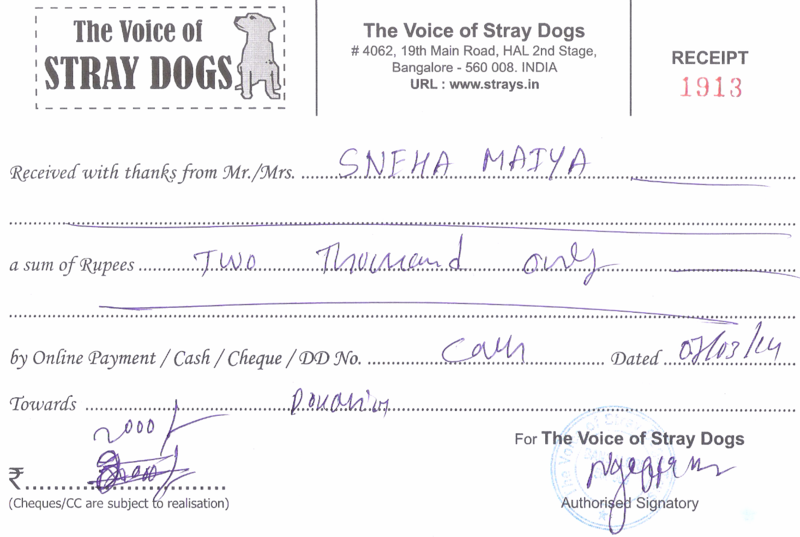 On March 17 a certain Sneha Maiya repeatedly called up 4 members of VoSD staff, and accused them of displacing dogs. She did so in-spite of being repeatedly told by each of them, that the dogs she was mentioning had been dropped back to the very same location that they were picked up from, after VoSD had tried to reach her, but she was not available to received them. Her response was consistently of shrieking and hurling abuse – without any reason being supplied as to why she thinks the dogs have been “displaced”, since she was not on location when they were dropped back, and had not even attempted to see them being dropped back, or requested anybody else known to her, to receive them. This issue was handled by the VoSD staff – to the point that each of them had to disconnect the call with her curtly, on account of the abusive nature of the call. Later at night I started receiving a series of mails emphasizing the same, and alleging that the dogs had been displaced, as above. I did respond saying that I will investigate and provide an answer the next morning; but to no avail. I cannot off hand answer, especially late at night, regarding every dog treated and returned back to location by VoSD. In fact, it is highly unlikely that the Head of any organisation can claim that he or she is possessed of all information, regarding every individual dog, at all times. I therefore suggested that Sneha Maiya wait until the next morning. Rather than do the same however, she persisted in engaging with me over e-mail, and alleging that the dogs had been displaced, and making very irresponsible allegations about my staff as well. From certain events that have transpired after that, it is seeming very probable that what was occurring was either premeditated and motivated. Her consistent assertion without being possessed of the requisite facts, or even waiting until the morning of the 18th of March to obtain the (allegedy) required information about the two dogs, is looking very much like a motivated attempt to besmirch the reputation of VoSD as a rescue organization. Sneha Maiya, who was not ‘on site’ at all, i.e. on the location to which the dogs were returned back, has, after her abusive calls to my staff all through the 17th of March, and her e-mail exchange with me, and without bothering to re-connect with us the next day, been writing to and talking to various people, and making allegations regarding “her dogs” having been displaced by VoSD. One such organisation that she wrote to was the Animal Welfare Board of India (AWBI). She also wrote to a senior officer of the Humane Society International (HSI). Neither the AWBI, nor the HSI, have any jurisdiction at all, over VoSD. In any event, neither are possessed of all facts; and the unrebutted assertions made by any party can by no stretch of imagination constitute the “truth”. A forwarded mail can easily be EDITED, as we all know. Sneha Maiya has created a mail exchange of her own and approached the said officers on the basis of this. Sneha Maiya has forwarded the alleged exchange of mails with me, to both, the AWBI, and the senior officer of the other organization. Interestingly at least one of them has continued to engage her without checking any facts with VoSD. This lends further credence to the belief that what has occurred, and continues to occur, is a concerted effort to bring VoSD into disrepute. This perception that Ms Maiya’s allegations are motivated is further compounded by the fact that one of the dogs reported by her (1707) was reported as a ‘weak’ dog – but was actually a large healthy female. Her movements and eating habits were normal through her stay with us. Surprisingly, the person that Ms Maiya had asked to hand over the dog to us (since she herself was not available when we picked them up, or when we dropped them back), was clear that he did not want the dog back! He specifically said so to our staff, who told him clearly, that the dog would be dropped back. Why Sneha Maiya took his help, is a mystery. What is also surprising is that Dr Chinny Krishna, Vice Chairperson of the AWBI (to whom Sneha Maiya had forwarded the mail exchange which contains some content that is not mine) – and which has been a reluctant handler of some animal exigencies in the past that’ve been reported on VoSD website as well – decided to make the same assertion about displacement of dogs without first checking with, and verifying from VoSD. It is also on record that in at least 2 previous instances, members / co-opted members of the AWBI, including the said person – have repeatedly demanded that VoSD remove some articles from the VoSD website, which were found inconvenient, for reasons best known to them. 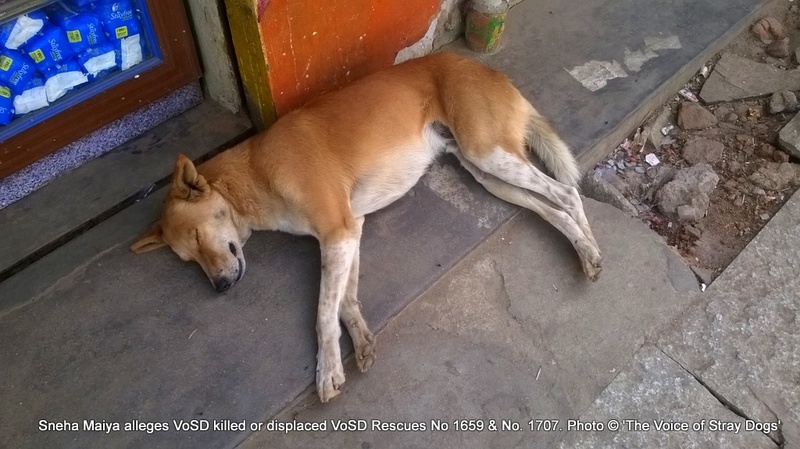 VoSD provides arguably the most sophisticated and elaborate healthcare delivery to stray dogs in India and in within its scale of operation in terms of management practice and medical practice – anywhere in the world. Including the Rescue Procedure which clearly spells out which dogs are picked up or not, how they are handled and what is the drop procedure and these are published as The VoSD Rescue Standard Operating Procedure. What is more when a rescue call is registered with VoSD, and the system sends out the mail to the the person logging the call to confirm the registration and providing a unique system generated tracking number – this document is sent out as well. And it is sent out each time the system sends out a mail. 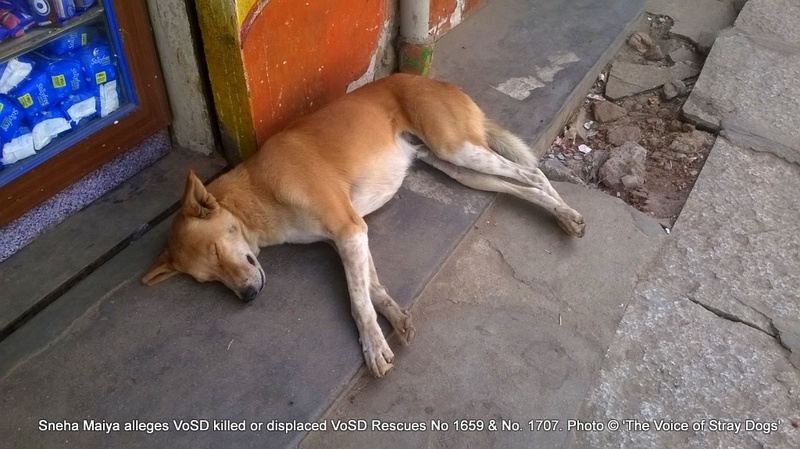 VoSD has encoded the complete process for dog rescue – from the time of receiving a call down to its release, in the world’s first, and arguably a system that rivals highly sophisticated human emergency and medical response systems – The VoSD Rescue CRM v3.0. The system makes it mandatory for each stage to be tracked including pickup – pick up timings, diagnostics, prognosis and daily tracking of the health of the animal – to its drop. This sophisticated system has even been made available by VoSD to other rescue organizations on a free trial. It is a key feature of the VoSD CRM that records can’t be edited or altered after they have been entered precisely to prevent tampering by any of the VoSD staff. Our commitment is to the dogs – over anybody else, whether it be our own staff, or any other person. Further the system sends out SMS and email alerts daily, for each update in the system, for the said animal, in the CRM! AWBI’s office bearer, before easily and inexplicably accepting what Sneha Maiyya alleged, obviously did not know about, and had not seen this system and assessed its capabilities! The VoSD CRM entries clearly show that the drops were made by the said VoSD staff at the recorded time and the recorded location. This includes dispatches of vehicles – and these are recorded in a master register and by individual logs maintained by vehicles. A paper trail is maintained as well, of all the medical intervention provided for dogs – each dog’s medical details are filed AND are digitized to create the CRM record. VoSD field staff is expected to take pictures of dogs at pickup, drop and during important medical procedures. Another team maintains, collates, numbers, watermarks and then uploads these pictures on Facebook and the VoSD website. Since this is not a care giving activity it is a tremendous overhead on the system – if you consider 1000+ animals in a 18 month period. Parts or stages of this process are sometimes missed due to the sheer volume and involvement. We do this however to share the prognosis and maintain a public record of the dog in our care. We don’t know if any AWBI affiliate including Blue Cross of India, Chennai, provides such exhaustive photographic access to all its animals. Both, in the case of 1659 & 1707, albums were maintained. See album of 1659 on VoSD Facebook Page & album of 1707 on VoSD Facebook Page. So what happened in the case of VoSD 1707 and VoSD 1659? After these allegations were levelled on 17th night, I had a meeting on 18th morning with the entire VoSD field staff and checked records. It was established that indeed the drop was made as the records indicate. It was also established that Ms Maiya had been abusive with each of the 4 staff before turning onto me, with mails that continued late into the night of the 17th, despite my suggesting that she wait until the next day. On 19th when she wrote to the said organisations that I’ve mentioned above – a team was dispatched to the drop area where 3 people scoured more than 140,000 sq m of the densely populated main roads and by-lanes of Magadi Road, around IIFT, in Vijaynagar, to track the dogs. One dog 1659 treated for a tumor by VoSD was found and photographed. The other dog 1707 which had no real problem but had been reported as ‘weak’, was not spotted. This, in itself, is not unusual since dogs don’t sit around and wait for our staff to go back to the pick up and drop off location, for photographing them. Healthy dogs move all over their area. It is clear from the case history including pickup and drop offs that Ms Sneha had only a ‘passing’ interest in these dogs. She was not on location either during the pick ups, or during drop offs. She directed the team to ‘other persons’, for pointing out the dogs. They signed the forms, she did not. She knew fully well she will not sign the VoSD agreements, and she never – not once – checked on the dogs during the course of their stay and treatment with us ; and in the case 1707, the person handing over the dog to VoSD clearly said he did not want the dog back (but agreed to sign the agreement since there is NO pick up, and there will NOT be any pick up, without the fulfillment of this condition). Rudresh went to the place to pick up, and then called the caller (Sneha) to point out the dog. 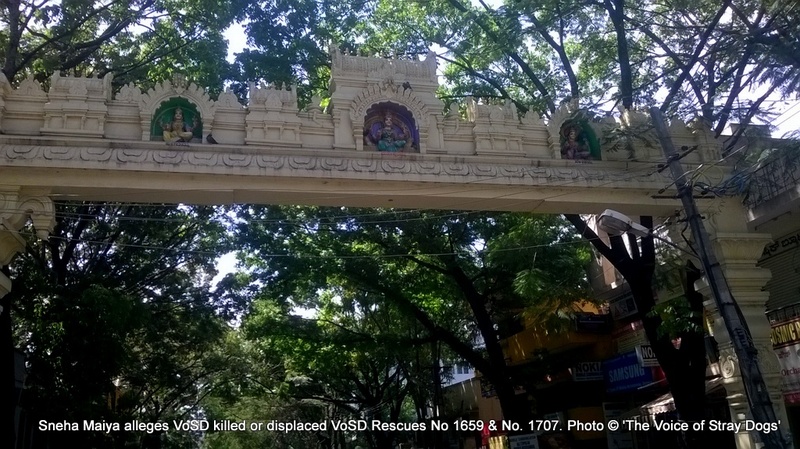 She, however, gave an alternate contact number, and asked him to contact another person on location for the pick up (which is against VoSD Rescue SOP). She clearly said she won’t be available in the place! Rudresh decided to pickup the dog despite her absence, since the location is more than an hour’s drive from VoSD location, and he had already reached the location. The person who Sneha had referred to was a (lady) vegetable vendor. The vegetable vendor did not have a permanent structure; she was selling vegetables on a cart. She did not give her name. Rudresh clearly explained the animal adoption form to the person and took the signature from the vegetable vendor. Hence, this tumor dog (i.e., Case No : 1659) was picked up in the absence of Sneha (the caller). Pickup was clearly in violation of the VoSD Rescue SOP, in that the caller was not available at the location ; but the dog was still picked up because it needed help. The fruit and vegetable vendors are not permanently located at any spot at which they may be found, on any day. As on 19 March 2014, when the team went back after Sneha’s calls, etc., this vendor was not to be found. In the 3 weeks’ time that the dog was with VoSD, Sneha Maiya never logged on the CRM to track the case or checked about the dog’s condition on phone, Facebook or email. Daniel tried to call Sneha on the number she had provided at the time of the 2nd rescue reported by her and was given as the default contact, to coordinate drop, which was 9740211300. There was no response on this number despite repeated attempts. Daniel’s phone was running out of power by 5:00pm since he had been out in the field the whole day. And he already had 2 drops and one pickup in his van. 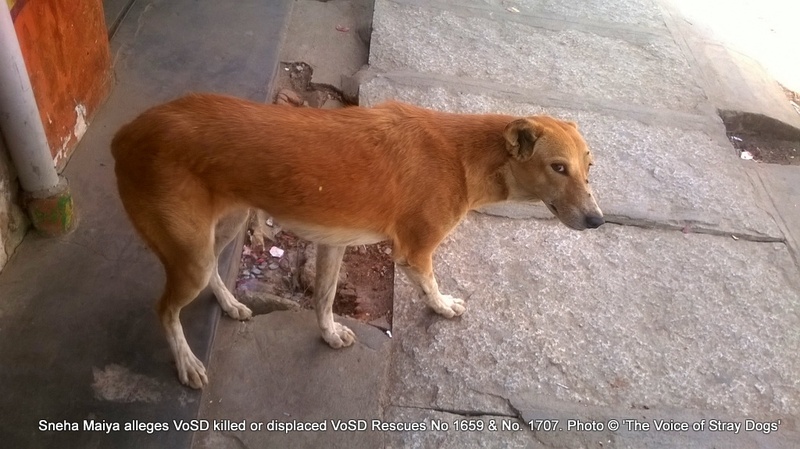 To ensure that he was able to update the back-office VoSD team, he sent the pictures of the dog from his mobile just before his mobile battery died, and proceeded for the drop. Daniel dropped the dog at about 5:30PM on 13th March 2014. Pickup details: The caller had reported a ‘weak’ dog. Rudresh went to the pickup place and called the caller (Sneha), but her mother received the call. She said Sneha was ‘not available’ on her mobile phone! The mother said that neither she nor Sneha will be available for the rescue pick up. She gave an alternate contact number of a person who would be ‘in the market at the time’. Rudresh called the alternate number which belongs to a Mr Govindappa, who resides in the market area. Rudresh was directed by Mr. Govindappa to the spot. Rudresh explained the VoSD animal rescue form to Mr. Govindappa. Mr. Govindappa, whom Sneha had asked Rudresh to contact, clearly told Rudresh that he does not want the dog back. Rudresh then clearly specified to him that VoSD does not keep dogs that have a care-taker or an owner, or by and large healthy dogs that can fend for themselves (if cured of the ailment or injury for which they are reported), and that the dog WILL BE released to the same spot after treatment, and when healthy. On being told that there would be no pick up without his signing the form, Mr Govindappa agreed and signed the form. Hence, this dog (i.e., Case No: 1707) was picked up in the absence of Sneha (the caller) and her mother. Rudresh called the VoSD Office to confirm pickup (as is procedure). Shortly thereafter Ms Sneha Maiyya called to check if the pickup had been made. On confirmation that it had been made – she said she was home and wanted to meet the pickup team. Since she insisted, the team drove over 2.5 kms, to reach her place. This is the only time any VoSD team member met her. She insisted on giving a ‘Donation’ of ‘Rs 2,000/-‘, though our SOP clearly says otherwise, and this is repeatedly reiterated on our Facebook pages. The donation was accepted only because sometimes the rescue staff find it difficult to refuse people they think may be important. Rudresh deposited the money immediately on arrival with the dog, to the Finance desk. As per procedure all receipts need to be issued within 24 hrs. Finance desk had to call her to get her email and mailing address, to issue the receipt. As stated above, she had refused in the first instance to provide her e-mail address, citing privacy reasons. The finance desk issued a receipt No 1913 on 7 March, and it was issued on e-mail and sent by post immediately. This is also reflected in a public record kept by VoSD on our website, of all donations received by VoSD. In the time that the dog was with VoSD Sneha Maiyya never logged on the CRM to track the case or checked about the dog on phone, Facebook or email. The drop off, of 1707 was made together with the drop off, of Case no. 1659, on 13th March. As stated above, Daniel had tried to call Sneha on the number she had provided to coordinate drop, which was 9740211300. There was no response on this number despite repeated attempts. As stated before, Daniel’s phone was running out of power by 4:30 pm, since he had been out in the field the whole day. And he already had 2 drops and one pickup in his van. To ensure that he was able to update the backoffice VoSD team, he sent the pictures of the dog from his mobile just before his mobile battery died, and proceeded for the drop. The sequence of events leaves little doubt that Ms Sneha Maiya’s real motivation was hardly, the welfare of the two dogs. She was not present during both pick ups, one on 25th February, and the other on 5th March. She actually lives a significant distance from the dogs reported. She chose not to be present even to identify the dogs. For reasons best known to her, she reported a dog that seemed healthy enough to the staff assigned to pick up, as being ‘weak’. For identifying that dog, i.e. the dog reported as being ‘weak’, she directed the rescue staff to a man called Govindappa, who clearly told the staff the dog was not wanted back in the ‘community’. Govindappa did not want to sign the VoSD form prior to pick up, but on being told that in that case, there would be no pick up, he did so. All during the course of the stay and treatment of the dogs, and until their release on 13th March, Sneha Maiya never logged on the sophisticated VoSD CRM, to track their progress, or even checked about the dogs on phone. 4 days after their release on 13th March, i.e. on 17th March, she started leveling false allegations with alacrity, and for reasons best known to her, brought office holders of AWBI into a discussion, even though the AWBI has no jurisdiction over VoSD. Very unfortunately, one or some of them chose, instead of getting acquainted with the facts of the case, to accept allegation for fact. The Animal Welfare Board of India office bearers that chose to accept allegation for fact will be well advised to stick to the matters that really mandate their full focus, including the matter of the ‘illegal’ Municipal dog pounds in Chennai. Note: By requesting VoSD rescue support you agree to the VoSD Rescue Standard Operating Procedure.